I have a new obsession, which has led to a fantastic discovery. With just a few days left to shop, I should be obsessed with what to get Rhonda for the holidays, but instead I’m obsessed with Cook’s Illustrated Cookbook and my new favorite breakfast – lemon ricotta pancakes. In the past, Rhonda had a subscription to Cook’s Illustrated Magazine, and I was never excited about it. There was no glitz or glam to entice me, instead the magazine has black and white sketched drawings and all those LENGTHY commentaries about their test kitchen findings (I know you might think I too have LENGTHY commentaries, but at least I’m trying to be funny). The magazine made cooking feel like a precision science project instead of a fun experiment in the land of culinaria. The magazine subscription went away for many years with only a monthly copy being purchased here and there from the grocery store check out line. If we made anything from those random purchases, I don’t remember. So I was surprised when we arrived at the Dusty Dog on November 6th and found a package waiting for us that included – four (Yes, that’s right four) Cook’s Illustrated cookbooks – each the size of jumbo encyclopedias from my childhood. Apparently, Rhonda felt the need to stock up on some new recipes for the daily cooking we embrace with gusto at the cabin. 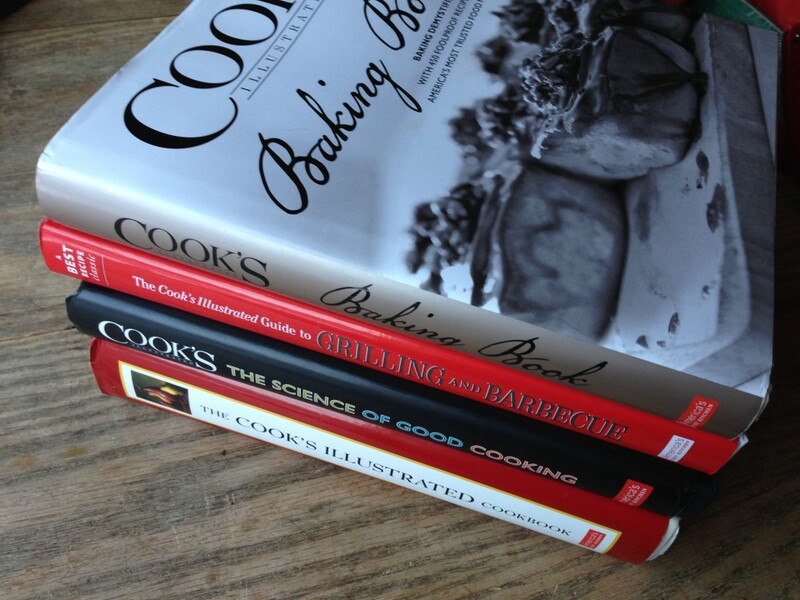 The four cookbooks were: Cooks Illustrated Cookbook, Cook’s Illustrated: The Science of Good Cooking, Cook’s Illustrated Guide to Grilling and Barbecue: A Practical Guide for the Outdoor Cook, and Cook’s Illustrated Baking Book. I haven’t had a chance to venture into all four of these cookbooks, but I have jumped into a swift and serious love affair with with the Cook’s Illustrated Cookbook. 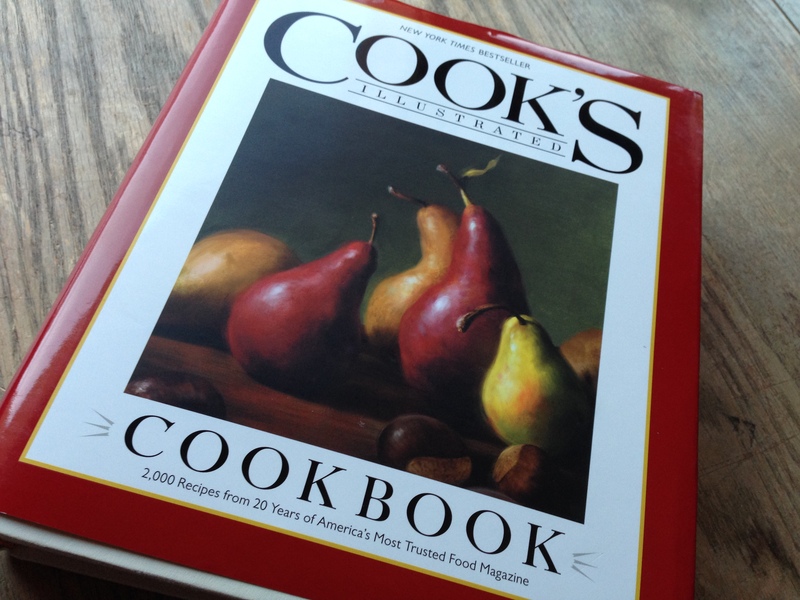 In the short time we’ve been at the cabin, Ive made, assisted in making, and eaten so many recipes from this glorious tome that I can hardly keep up. The other night I made their shrimp scampi (page 455) that popped with a beautiful citrus and garlic tang, and a couple of weeks ago, I made their hearty baked brown rice with onions and roasted red peppers (page 225), which was like a rich risotto without all the stirring. On Thanksgiving I used their dressing recipe (page 365) as a guide, and the other night I made their saute’ed eggplant with crisped bread crumbs, (page 263) which was melt in your mouth good. Rhonda has ventured into making their simple beef chili, (page 96) which she reserved some for me without meat, and last night she made pasta with garlic cream sauce, (page 164) which was savory, rich, and wonderful. She’s also made their crunchy oven-fried fish, (page 441) which was just like they said – crunchy. Every single recipe we’ve made has been delicious. I mean not a bite left on the plate delicious. You can see how all of this has become an obsession. Every day, I wake up thinking about what to make for dinner. After all of this frenzied Cook’s Illustrated Cookbook cooking, I decided to reconsider the monthly magazine. Turns out, Rhonda has resumed her subscription via her Ipad and a couple of weeks ago she made their Herb Crusted Salmon (May/June 2013 Issue), which was so great we had it twice in one week, serving it to friends the second time around. 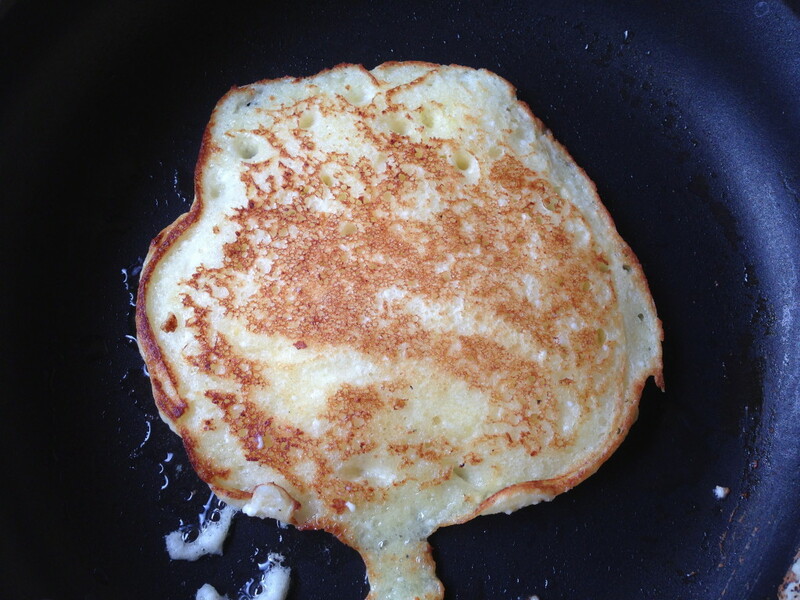 And then, I discovered lemon ricotta pancakes (September/October 2013). OH MY GOD is all I have to say about these pancakes. Ok, well really I have a little more to say about them – like how fluffy and lemony they are, and how airy and just the right amount of sweet they are, and how they sound kind of complicated with the whipping of the egg whites, but I promise if you go the extra yard for this breakfast confection you won’t be disappointed. In fact, you will be wondering when you can make them again. Wow, all of this over a cookbook and a magazine! It’s a lot I know, but it’s all true – every word. If you have a cook on your holiday list, run out and buy them a subscription to the magazine or get them a copy of the cookbook – they will love you (I mean LOVE you) for it, and you will probably reap the rewards too. I haven’t had a chance to look at the other three cookbooks yet, but look out, for when I do, you will be sure to hear all about my latest obsession. 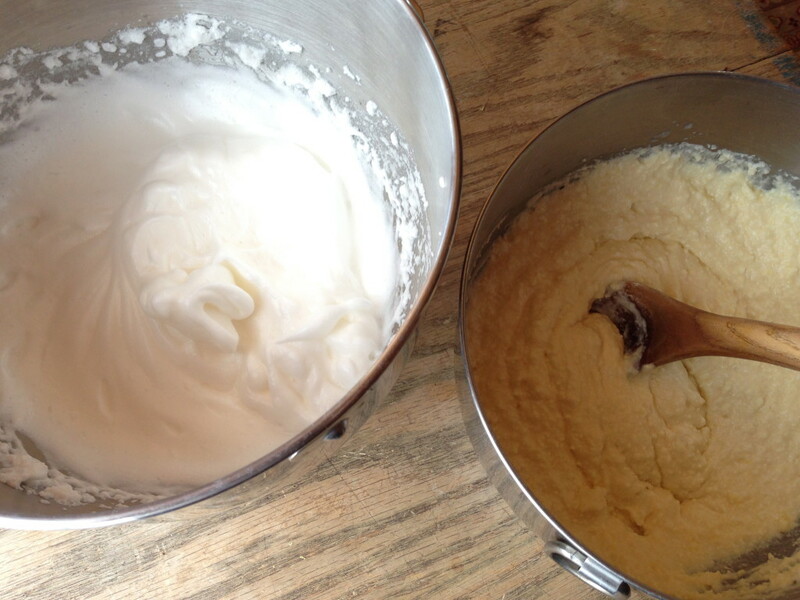 Separate the egg whites and place them in an electric mixer fitted with the wire whisk attachment. 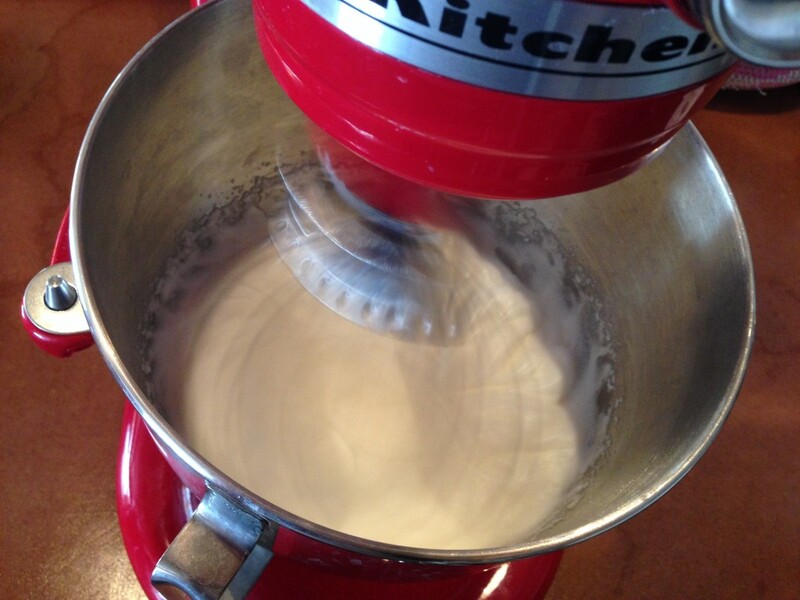 Turn the mixer to high and whisk egg whites until peaks begin to form. Add sugar and whisk another two to three minutes. Whisk together the flour, baking soda, and salt. 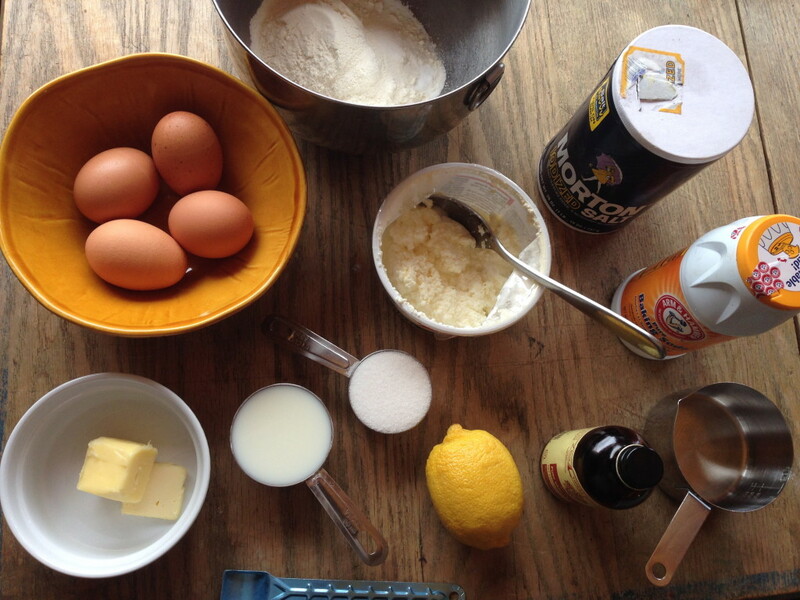 Make a well in the center and add ricotta, the two egg yolks, milk, lemon zest, lemon juice, vanilla, and melted butter. Mix thoroughly with a large spoon. Gently fold in the egg whites and mix thoroughly. Heat oil in a nonstick pan. Once heated, wipe away excess oil. I like small pancakes because they are easier to flip. I use about 1/4 cup of batter per pancake, but if you are an expert pancake flipper don’t let me hold you back. Pour 1/4 cup batter into the hot pan and allow the pancake to cook 2 to 3 minutes until you see tiny bubbles appearing and disappearing in the batter. Gently flip the pancake and allow to cook another 2 to 3 minutes making sure not to burn them. While we’re on the subject of burning things, I have a confession to make. The first time I made these pancakes, they all looked like the one AND ONLY pancake pictured throughout this post. Each one was fluffy and light. This time around, the pancakes gave me a fit. What I’m trying to say is, I threw a fit because the pancakes turned out flat, and on top of that, I burned them. The keys to making these pancakes work is wiping the pan clean of excess oil, keeping the heat on medium high NOT high, and working quickly with your ingredients. In other words, don’t dally around taking a bunch of pictures between each step of the pancake making process. Serve these pancakes with syrup or confectioners sugar. Raspberries and blueberries go great with them too. As you can see, I ate mine with some fake bacon and maple syrup. Note: The recipe made more than we could eat. We had the left overs for dessert at dinner. They were delicious cold and without syrup. 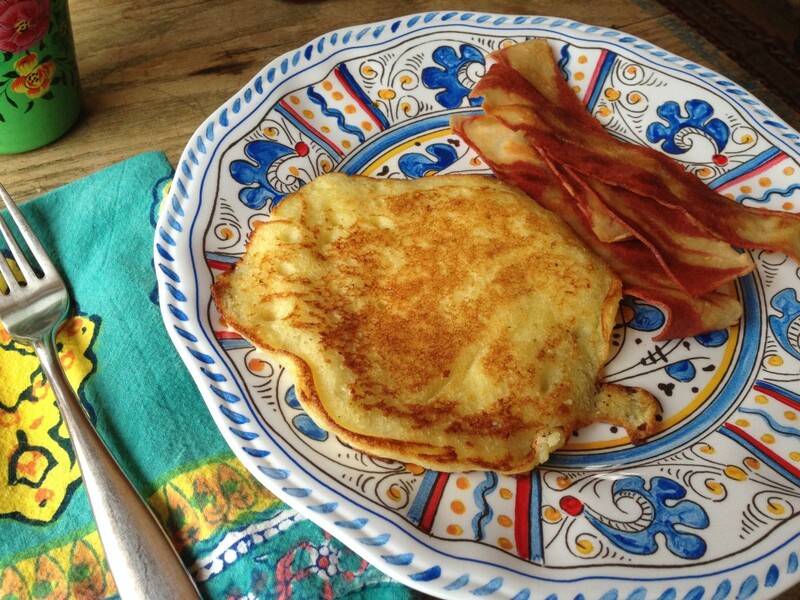 This entry was posted in Breakfast, Brunch, Pancakes, Recipes, Uncategorized and tagged Breakfast, Brunch, Cookbooks, Entertaining, Jasmine Brown Rice, Lemons, Pancakes, Ricotta. Bookmark the permalink. 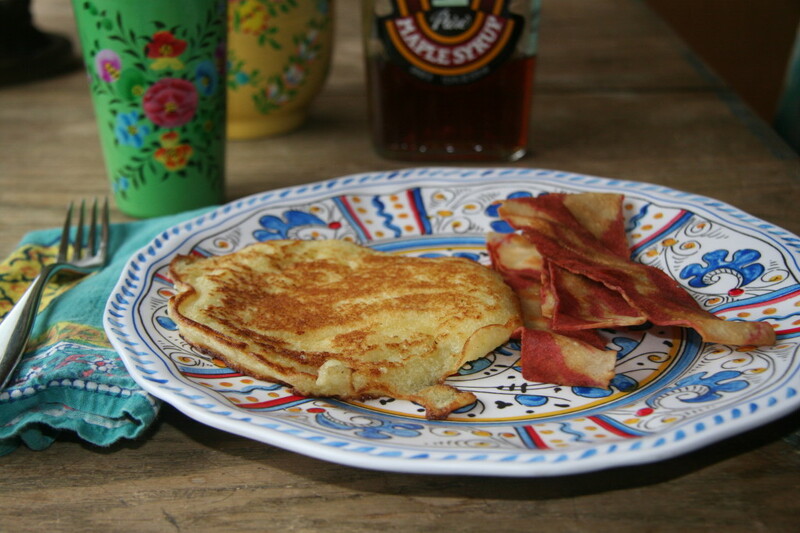 Yum, i would like to make these pancakes for New Years day. Thank you for your great recipe. Thanks Faye – happiest of new years to you and Howard too! Hope you had a great anniversary!!! This looks great! Can’t wait to try it. Hope you all are well and have a happy 2014!